If you've been wondering where I've been the last couple weeks, here's the scoop. I've been on jury duty for a criminal case. Jury selection started Tuesday, January 20, and concluded on Wednesday, January 21, when the trial also started. We've been deliberating since Wednesday, January 28, and finally finished at 4:00 pm today. Talk about intense! It was draining, so I didn't get much done at night. So for those of you waiting for email answers and/or stuff to come in the mail, I am slowly working through all that stuff. Don't give up! On a good note, last Sunday I did get a chance to visit the barn and give my main squeeze a full day of beauty and a whole lot of hugs. And I passed that goodness on to four other horses as well. I just love coming home smelling of horses! Dirty, tired...and extremely happy. So that's what's been happening in my world. What's new with you? P.S. I am listening to Havana Storm by Clive and Dirk Cussler, and The Faraway Horses by Buck Brannaman. Hard as it is to believe, I have not listened to a single audio book since the trial started. I'm looking forward to that pleasure again as well. P.P.S. It was so good to meet you, KathleenC! Nice to put a face to a name from the comments! For the better part of a year I have been closely guarding a secret. When Joan Ford started her new book, she asked me to contribute to it. 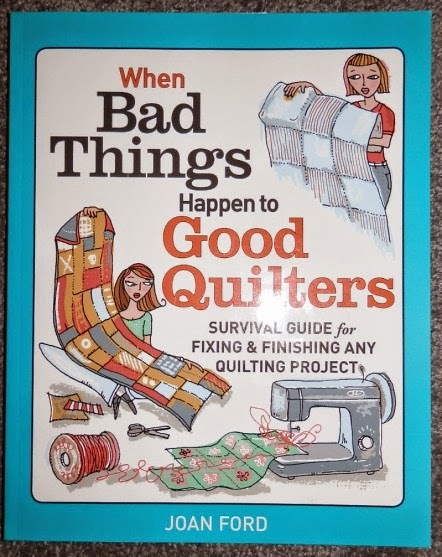 Recently published, Joan's book includes a section on hand piecing by--wait for it--ME! See pages 57-59. And Joan included a hand piecing project in the back of the book which is so darn cute and combines both hand piecing and hand applique! There is a ton of useful information in this book--truly something for everyone! Check it out! Thanks, Joan, for including me! We've all seen them, all coveted them, and ultimately bought them. 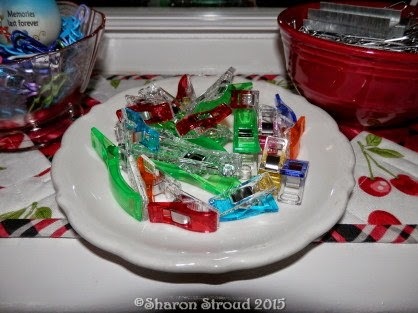 Yes, those Clover Wonder Clips! I have the original small red, the longer green, and the newly-released short neons! For easy access, I tossed them onto a small old Syracuse China plate. Don't they look festive? 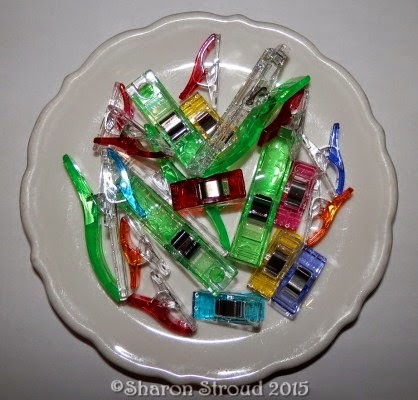 And here is where they reside: on my windowsill between a pink depression glass dish of coated paperclips and a Fiestaware knockoff of uncoated paperclips and small runs of staples. Notice the runner under these lovelies--it's an older design of Joan Ford's. My absolute favorite for narrow places. That's what's new in my world tonight. What's new with you? Please share in the comments! 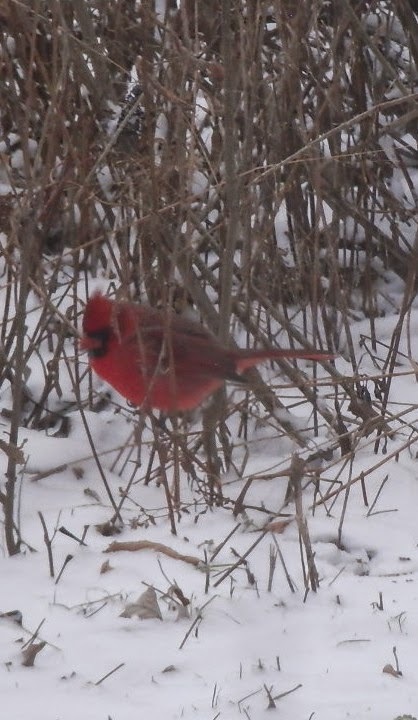 Many thanks to those who take time to comment--it makes my day! Brown and white...and a touch of red. It doesn't just happen, you know. Many erroneously believe that a finished class sample (or anything else) just magically happens in one go. Not so much. 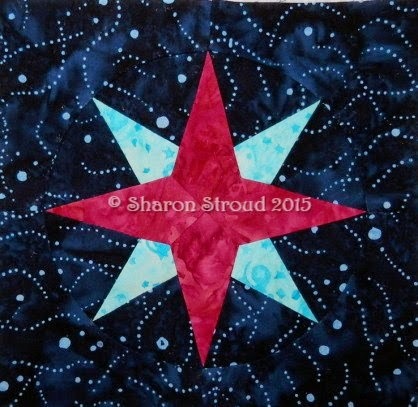 Here's a look at the dilemma of choosing fabric for another sample of my Mariner's Compass Bliss. These are all batiks. It is a lime green around the center circle, but it doesn't show well in the pics, but does in the finished center. The big dilemma was the background. I had chosen a background (seen in the last two pictures) and was trying to decide if I really wanted to use it or if it would be too busy. So I hedged my bets and bought this dark navy, thinking I would like it better. In the first picture, it looks like it will be okay, but in real light, the purple was almost invisible. I cut all 16 of them and laid them in. Still not quite right. My problem stems from choosing the design fabrics to go with the busy background. Still not quite willing to commit to this large a project and not be sure, I hand pieced this smaller star (this finishes at 8 inches, the larger one in the other pictures finishes at 20 inches). My main concern was that the background fabric was so busy and sort of directional that I wasn't sure how it would look when pieces met in such a random fashion. The only way to determine that was to piece a star that is set into a circle. I rather like this and decided that that was my original plan and I should just get a move on. So...I cut (re-cut) all the background pieces and the corners and laid them into the pattern. The lighting when I took this picture makes everything look washed out. Trust me that these colors are very vibrant. The picture above is more true to color. I am happy. 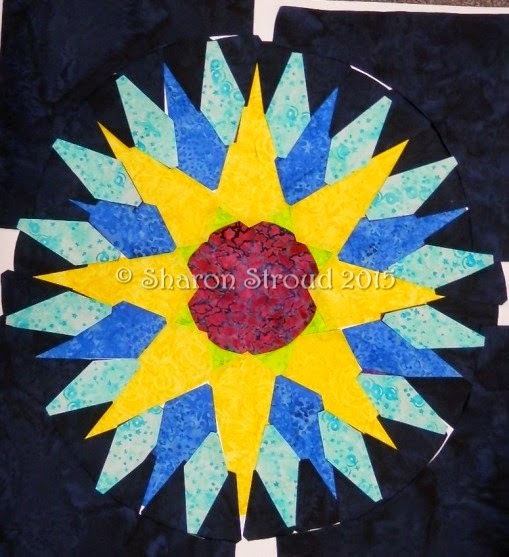 I have the yellow points added to the circle and small points and have started piecing the pie shapes. I'll show you progress as I go. 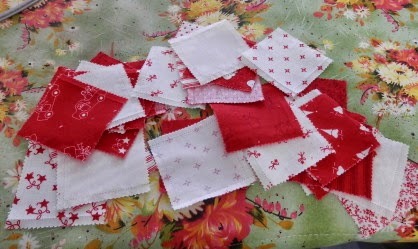 Hand piecing...feel the bliss! I did cut all the setting pieces for this quilt so that I know how much more fabric I have to work with. 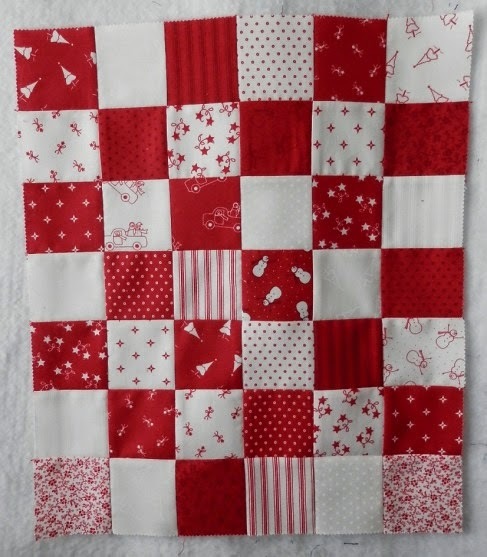 I'm pretty conservative about my fabric usage but I did have one quilt I did a while ago where I had to fit the last few pieces onto a very small piece of fabric and I couldn't buy more. Scared me enough to make every inch count! That's it for tonight. 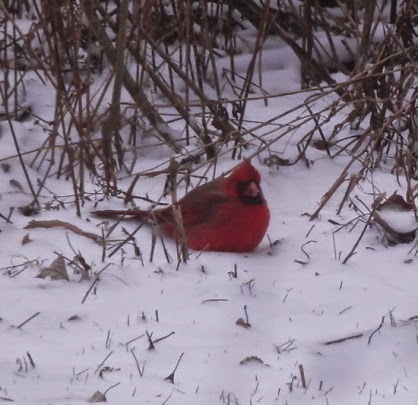 It is so cold here that I can hear the house popping. It's fun to take empty pop bottles (with caps on) out on a night like this--they snap, crackle and pop and compress themselves. When warm again, they pop back into shape! It's especially fun the first time it happens and you don't know about it and you have them in the car and things start popping! Just sayin'! P.S. I just finished listening to Mean Streak by Sandra Brown and started Pegasus by Danielle Steele. 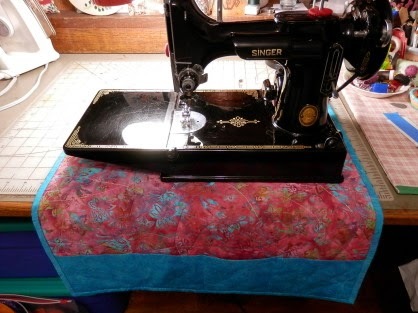 There are many tutorials on the web for sewing machine mats; here's my recipe for a very simple one. You need a 21 inch square of backing and a piece of batting the same size (I used vintage Thermore). Select the fabric for the top of the mat and cut a square 20 inches. (I always make the batting and backing pieces larger than the front; for this mat I only added an inch on each side.) Layer the backing right side down + batting + quilt top face up. Pin baste or secure however you like best. Quilt as desired. 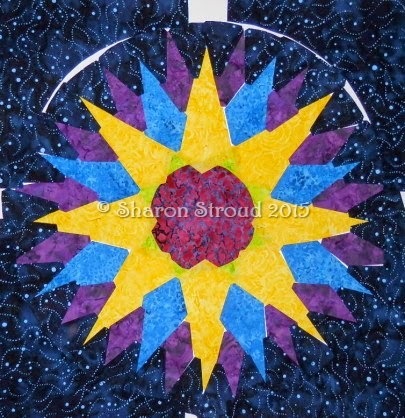 Much of the quilting will be covered by the machine. You could draw a grid, practice some free motion quilting, or do what I did--sort of a free motion of organic lines using my Featherweight. Easy, free-flowing lines from one side to another. No pattern, no drawing. I used a variegated quilting thread on top and bottom. 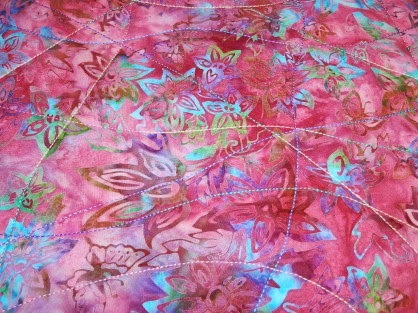 The thread picked up every color in the batik! 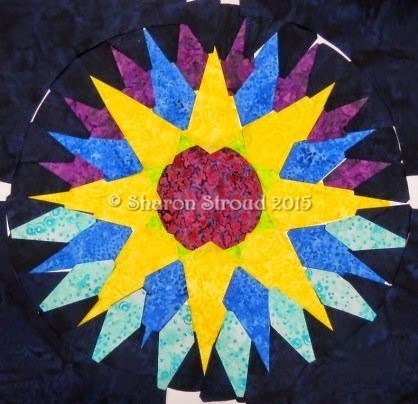 Once you are done quilting, press the piece. 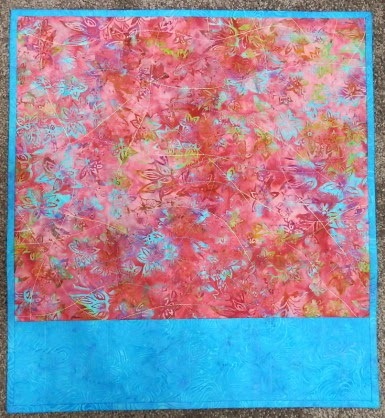 Now cut this quilted fabric into a rectangle 18 x 19.5 inches. If you are using a directional fabric remember to correctly orient the rectangle measurements. The long side (19.5) goes from the back of the machine to the front where the pocket will be. From your pocket fabric, cut one piece 8.5 x 18 inches. Fold in half wrong sides together and press. You will have a pocket piece that measures 4.25 x 18. Lay this in place on the bottom edge of the quilted/trimmed fabric and pin in place. You can draw in your dividing lines to make smaller pockets so that your tools/scissors will stand up in the pockets for easy retrieval. You can lay your tools on top of the pocket piece to see what size dividers you will need. Baste the pocket in place around two short sides and one long side (bottom). Stitch on divider lines. You will need three WOF strips to make the binding. I decided to hand stitch my binding on the back side so I cut my strips 2 inches. You can choose a binding width that is most comfortable to you. Bind around the entire piece. 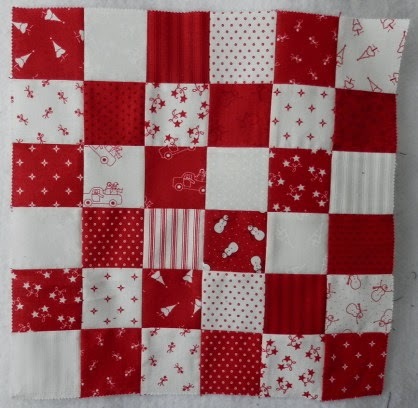 Hand or machine stitch the binding to the back and you have a fabulous mat! You may want to check the width of your machine to be sure the mat is big enough for your machine. If not, start with a square a couple of inches bigger than what your finished piece will measure and work from there. This will be really handy at classes or retreats where we all tend to spread our tools over every available flat surface. Having scissors, ripper, pencil, etc. within easy reach will save time and aggravation. And for those of you who need to break down your sewing "room" after every session, this will keep those small tools corralled and help protect whatever surface you are working on. So there you have my first finish of 2015! It really is a bare-bones pattern, so if you have any questions please ask. 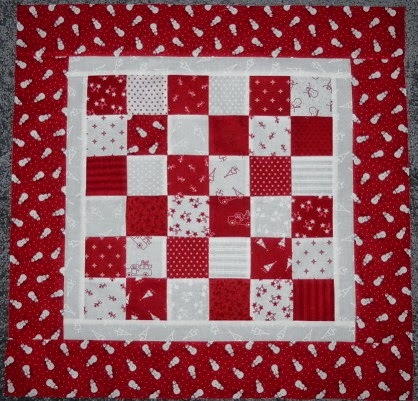 And if your first attempt at machine quilting doesn't go so well, I'm sure one of your pets would be thrilled to have it for a bed! Not that you'll have any trouble, but...it's always good to have a Plan B. ;-) Don't ask me how I know! Last night I had the pleasure of riding with two other ladies from the barn. Not a lesson, just the three of us "horsing" around! I got to groom and ride my main squeeze, Pompera. I've been lucky enough to spend more time at the barn grooming and just spending time with the horses. Tomorrow I'll show you what I've been working on today. 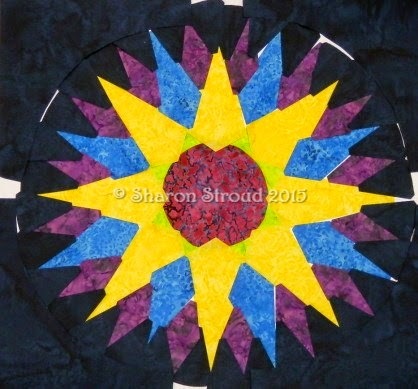 (Yes, it's quilting related!) I'm still undecided about the background and may try out a couple small blocks to decide since it is hand piecing and a fairly large project. I second guessed myself on it and bought different background. Now I'm thinking my first choice may have been best. P.S. Check out my hand--doesn't it look fake? And much too graceful to be attached to me! Then I got out my trusty ripper and took it all apart, all 42 squares. I started again, using the design wall (note to self and others: always lay things out on a design wall, not any flat surface!). The problem? Trying to use all 42 squares. There were duplicates of many, making arranging harder. Finally, I called uncle and took out the pieces I was not happy with in the mix. Then, I arranged the "light" squares into "patterned", "not patterned" diagonal rows which satisfied my need for a bit more order. Small border, larger border, Bob's your uncle, and it's a quilt top! 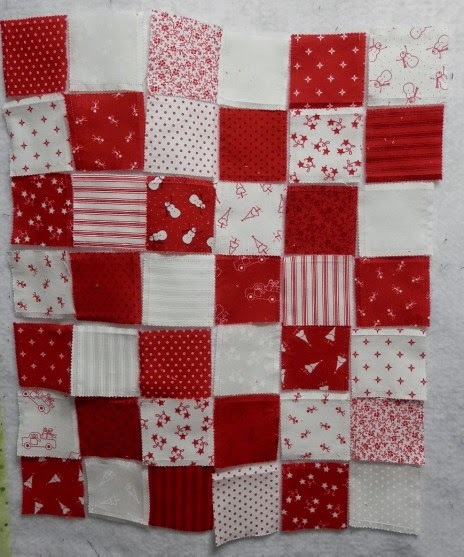 I do have it basted ready to quilt. Still pondering design and thread color. For what was supposed to be a quick project, it sure turned into something monumental! A quiet day here. 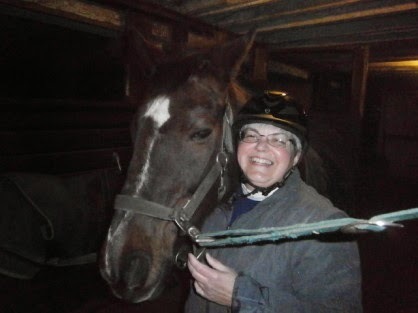 I actually went to a New Year's Eve party hosted by my riding instructor. It's the first time I've been out on New Year's Eve in probably 30 or more years! We talked about--wait for it--horses! Who knew? P.S. I am listening to Live to Tell by Lisa Gardner.